Those looking to buy a PSPgo can also pick up a PSP game free of charge until March 21. Sony is launching a promotion with the PSPgo that will allow those purchasing it to receive a free copy of either Assassin's Creed II: Bloodlines or the PSP version of Little Big Planet. US and Canadian consumers will be given a promotion code that can be redeemed at the PlayStation Store by logging onto a pre-existing PlayStation Network account (those without accounts can make one in order to redeem their game), where they can then download the game onto the Go. 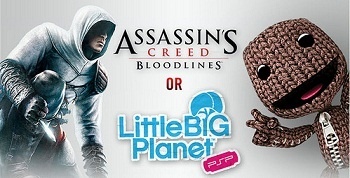 With Bloodlines and Little Big Planet retailing at $39.99, it's not a bad deal for those looking to pick up a PSP and one of the two games tied to the promotion.